A reboot of the long-running franchise (11 sequels and counting), this riotously bad taste comedy horror delivers about as much gory fun as you could hope for from a film about Nazi puppets on a murder spree. Scripted by acclaimed genre filmmaker S Craig Zahler (Bone Tomahawk, Brawl in Cell Block 99) and co-directed by Swedish horror duo Sonny Laguna and Tommy Wiklund, the film begins with a 1989 prologue in which disfigured German dollmaker Andre Toulon (Udo Kier) arrives in a small Texas town and commits some murders before getting killed by police. Thirty years later, the townsfolk are commemorating the Toulon killings with a convention, and divorced comic book artist Edgar (Thomas Lennon) arrives in town with girlfriend Ashley (Jenny Pellicer) and comic store buddy Markowitz (Nelson Franklin), intending to sell a sinister puppet he inherited from his dead brother. However, when the Nazi puppets come to life and start slaughtering the guests at the convention's hotel, the trio are forced to fight for their lives. 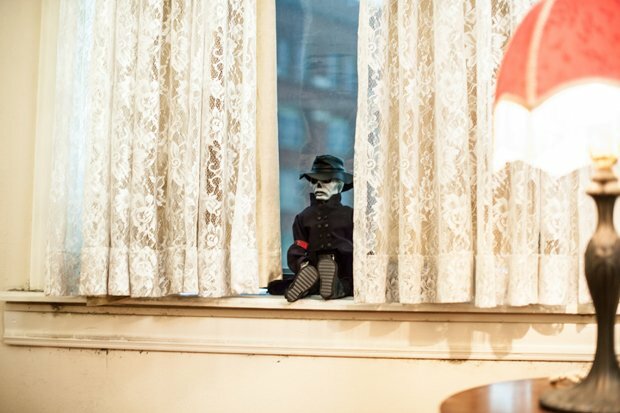 Seemingly hell-bent on notoriety, The Littlest Reich sets out to shock and gleefully revels in its own offensiveness, particularly in the puppets' choice of victims. However, if you can get past that (and if you can't, what are you doing watching a film about Nazi puppets? ), this is an absolute treat for gore-hounds, as the filmmakers deliver a smorgasbord of inventive, splattery kills, all of which are achieved with impressive practical effects rather than CGI. You'll believe a puppet can disembowel a victim. The film also benefits from an accomplished comic cast. Lennon is a master of deadpan and Franklin has a good line in dry sarcasm, which is put to amusing use here. There's also strong support from horror icon Barbara Crampton (as the cop who killed Toulon) and Charlyne Li as a sweet, nerdy hotel employee, while Skeeta Jenkins gets several big laughs as a beleaguered security guard. Limited release from Fri 19 Apr. At a convention in a small Texas town, Nazi puppets come to life and start slaughtering the guests. Anyone who chooses to watch a film about Nazi puppets should expect it to revel in its own offensiveness, but it’s an absolute treat for gore-hounds, and there’s accomplished comic work from the cast. Riotously bad taste.